Secure Shell (SSH) is a TCP/IP service that provides a secure mechanism for remotely logging into one system over either a local network or the internet from another system. SSH also provides the ability to transfer files between remote systems. When a user logs into a remote Red Hat Enterprise Linux 5 system using SSH, they receive a command prompt allowing them to enter commands on the remote system as if they were sitting at the remote system and had opened a terminal session. In this chapter we will cover the steps necessary to configure an RHEL system to accept SSH connections. This involves installing the SSH server on the local systems and configuring the firewall to allow SSH connections. The installation process will download the SSH server, install it and start the service running in the background. You may now attempt to connect from a remote system (see below for details of how to do this). 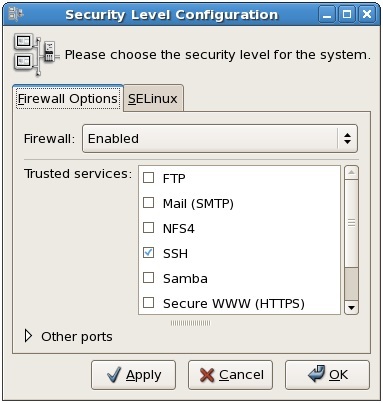 If you receive a "connection refused" message when you try to connect it you may need to configure the firewall to allow SSH connections to be established to this system.